Disney Theatrical has recently placed its Classroom Education Series on its Broadway hit Mary Poppins on its official YouTube channel. The spectacular ten-part series is hosted and narrated by Gavin Creel who held the role of Bert in the original West End production in London. From co-creators Thomas Schumacher, president of Disney Theatrical, and legendary theatre producer Cameron Mackintosh, to Disney Legend Richard Sherman to the cast and crew of the staged productions, the series meshes behind-the-scenes footage with archived footage, photos and more to explore the many facets of the production starting with Walt Disney acquiring the film rights from Mary Poppins creator P.L. Travers. 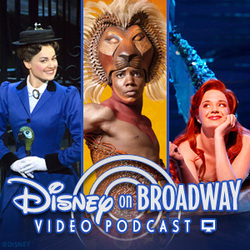 Over an hour of of material is presented in the series in total and it’s definitely worth investing some time for anyone who’s a fan of Disney or Mary Poppins or — better yet — both! Below we have embedded the full playlist of the series beginning with Part I.